When you are having a classic movie night, do you ever wonder who made the great jewels in the film? Well, chances are they came from Joseff of Hollywood. 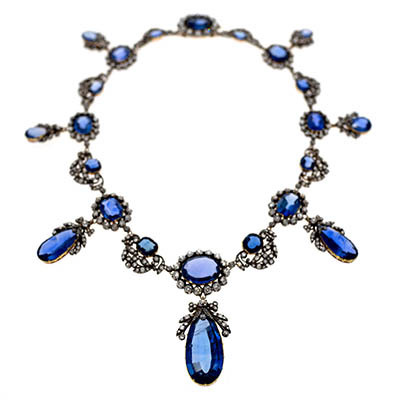 The costume jewelry designer’s work was featured in over 1,000 movies. Penny Proddow and I came across Joseff’s work constantly when we were writing our history of fine jewelry in the movies, Hollywood Jewels. There were any number of jewels we thought were real at first glance that turned out to be Joseff. 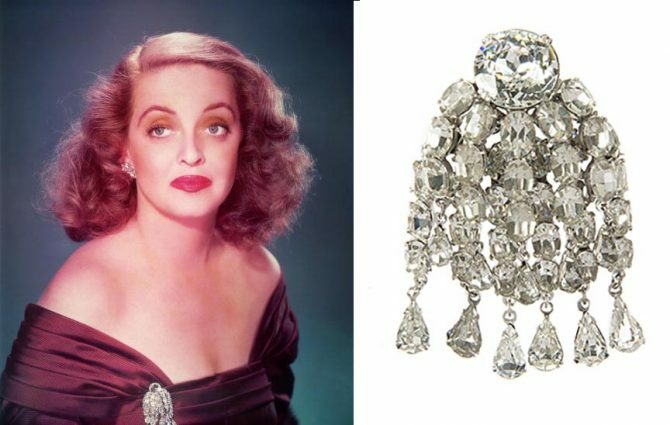 The brooch that sparkles like diamonds on Bette Davis in the key scene of All About Eve when she utters the famous line, “Fasten your seat belts, it’s going to be a bumpy night” is not diamonds at all. It’s Joseff of Hollywood. 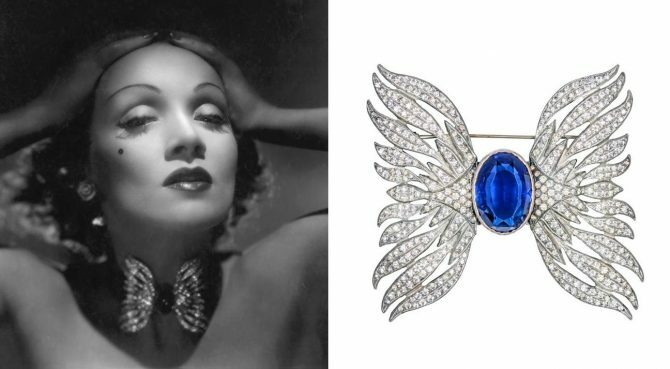 Marlene Dietrich posed in a sparkly winged brooch for publicity stills promoting her 1939 film Destry Rides Again, that Penny and I were convinced was Verdura. After all, the star had a legendary collection of fine jewelry including a bracelet from the titled Italian designer. The Duke of Verdura, however, was not responsible for the winged brooch. It was Joseff of Hollywood. Now these two pieces are among 600 lots of Joseff of Hollywood jewelry being offered at Julien’s Auctions in Los Angeles. The costume treasures come from a collection that Joseff’s wife Joan, preserved as a special archive after they were worn by an iconic star in a film or publicity still. On November 18, the jewels will be sold at Julien’s. The online portion of the giant sale is live now. Click here to see the jewels and drawings being offered. 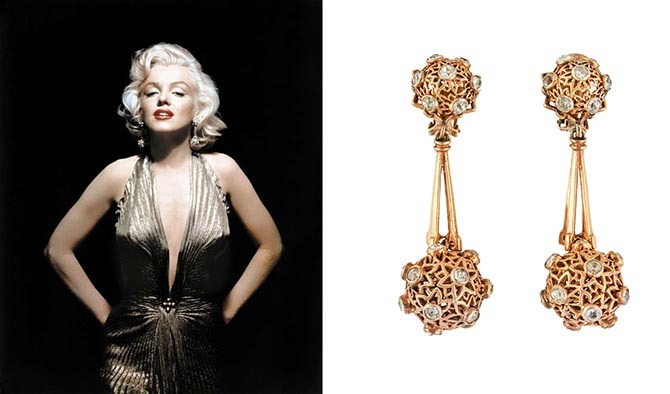 Marilyn Monroe wore the gold-plated clip-on earrings featuring filigree spheres accented with simulated diamonds from Joseff of Hollywood with a gold dress in a series of iconic Fox publicity images by Frank Powolny to promote ‘Gentlemen Prefer Blondes’ (1953). 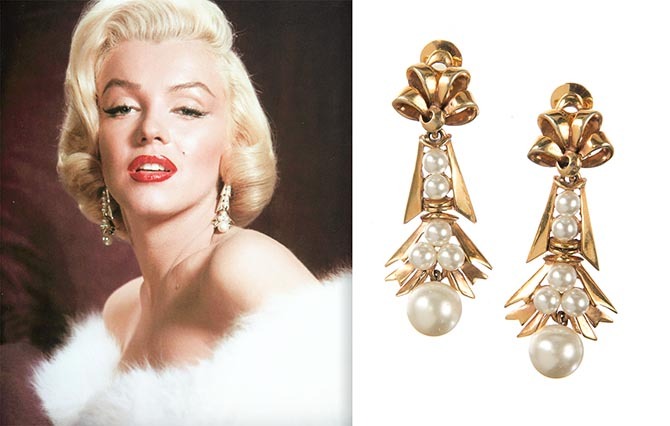 The Julien’s Auctions estimate for the earrings is $60,000 – $80,000. So, who was Joseff of Hollywood? The Chicago born Eugene Joseff moved to Los Angeles during the Great Depression. A commercial artist by trade, he eventually transformed his hobby of making jewelry into his profession and became Joseff of Hollywood when he started supplying studios with jewels. Over the years, he created an epic catalogue of items that he rented to productions. His work was sought after by costume designers, because Joseff paid careful attention to details, setting every piece by hand as though it were precious. Joseff analyzed the impact of his jewels on screen and came up with ways to make it work best in the medium. One of his innovations, according to the company’s history, was to tone down the color of yellow metals in a style he dubbed Russian plating. The technique reduced the reflection of the jewels in the lights. As for the name, it didn’t have anything to do with an age old technique or Russia. Joseff just thought using the term Russia made it sounded like something special. 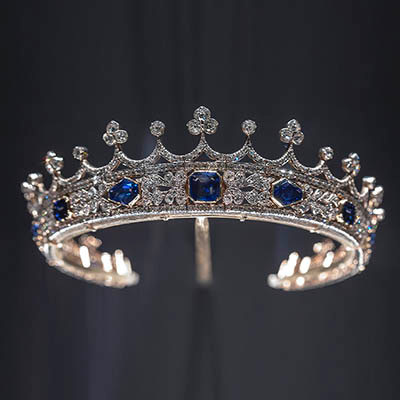 Joseff used jewelry history books as inspiration for all the pieces he created for period dramas. His work appears in any number of historically set films. 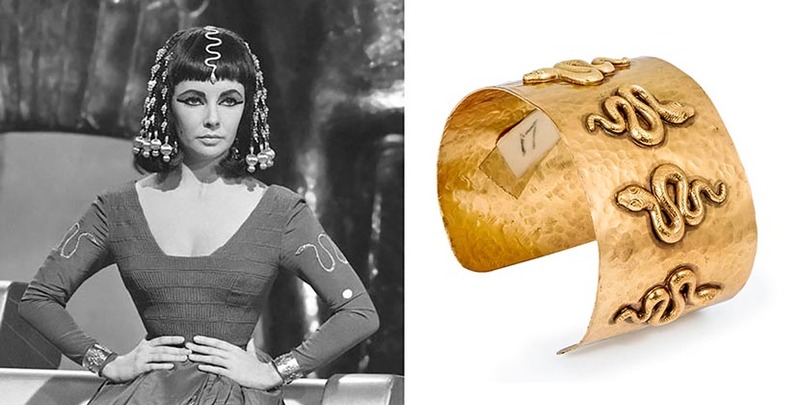 A couple of Joseff pieces in the sale were part of Elizabeth Taylor costumes for Cleopatra. 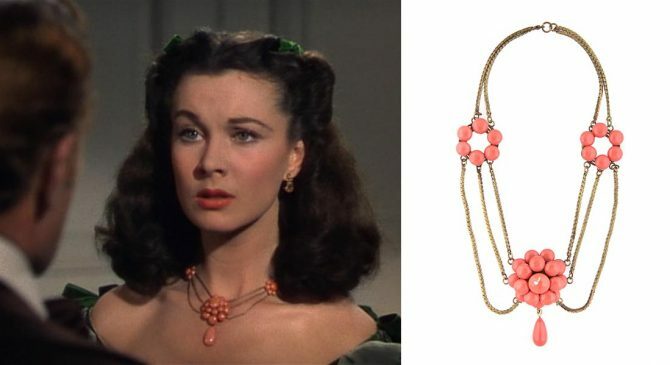 Several jewels in Gone with the Wind were made by Joseff including Vivien Leigh’s simulated amethyst and diamond and coral color necklaces. The famous cigar case Clark Gable carried came from the Joseff archive. 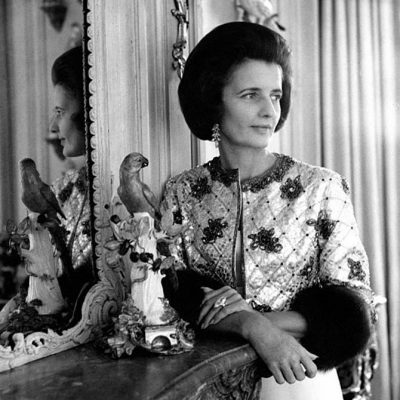 Joseff’s reference library included a collection of Harper’s Bazaar magazines. He used the fashion publications as inspiration to create contemporary jewels. The pieces were loaned to actresses for movies and the publicity stills they sat for to promote their films. Marilyn Monroe is featured in some super glam photographs surrounding the publicity of Gentlemen Prefer Blondes wearing Joseff of Hollywood. 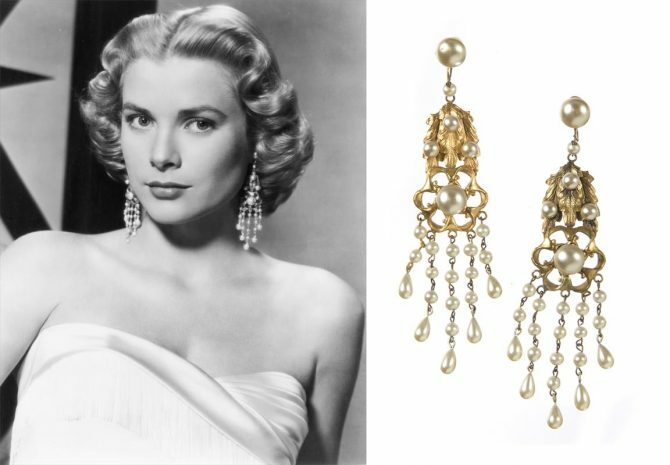 A pair of gold-plated, clip-on chandelier earrings, done using Joseff’s signature Russian plating technique, with simulated pearls was worn by Grace Kelly in a publicity still for ‘High Society’ (1956). 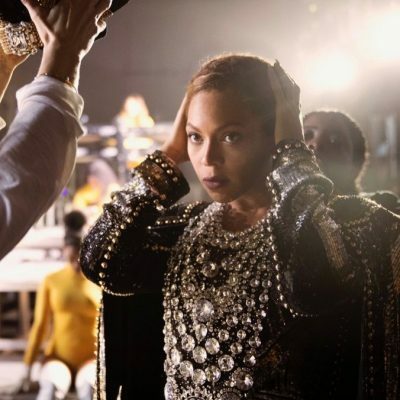 The Julien’s Auctions estimate for the earrings is $10,000 – $15,000. Photo Julien’s Auctions. Grace Kelly may have been engaged to a marry a prince when she made High Society in the mid-1950s, but she wore Joseff of Hollywood in a publicity still for the movie. Learn more about the Joseff of Hollywood in the video from Julien’s Auctions.